Anaesthesia is an evolving medical specialty, with new drugs, techniques, and equipment constantly being sought to improve patient safety and outcomes. 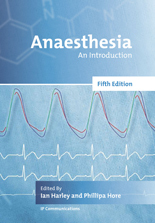 In this book, Australasian medical students, junior hospital doctors working in anaesthesia and critical care, and anaesthesia nurses and technicians will find a succinct and readable introduction to the principles and practice of anaesthesia. The book is structured as follows. It opens with an overview of general anaesthesia, regional anaesthesia, and sedation. Requisite knowledge of physiology and pharmacology is outlined. Comprehensive coverage is then provided of core topics: perioperative management of patients undergoing surgical procedures, anaesthetic techniques, anaesthetic subspecialities, pain, anaesthetic equipment, and the anaesthetic environment. For this fifth edition of the book, all original material has been thoroughly reviewed and updated. Extensive revisions have been made to coverage of preoperative assessment, intraoperative management, anaesthetic emergencies, and postoperative care. Coverage of anaesthetic subspecialities has been substantially expanded. The section on resuscitation includes coverage of new guidelines and equipment. The section on acute pain is new, highlighting the importance of this topic. Paperback, published, September, 2012. 245 x 170mm. 424 pages. Paperback. ISBN: 978-0-9808649-5-3. $A75.00 rrp.